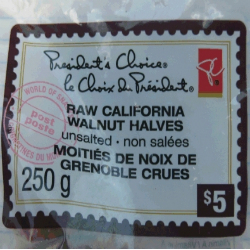 OTTAWA, September 1, 2011 - The Canadian Food Inspection Agency (CFIA) and Johnvince Foods are warning the public not to consume certain prepackaged raw shelled walnut products described below because these products may be contaminated with E. coli O157:H7. are affected by this alert. There have been no confirmed illnesses associated with the consumption of these products. Johnvince Foods, Downsview, ON is voluntarily recalling the affected products from the marketplace. The CFIA is monitoring the effectiveness of the recall. For information on E. coli O157:H7, visit the Food Facts web page. For information on all food recalls, visit the CFIA’s Food Recall Report. To find out more about receiving recalls by e-mail, and other food safety facts, visit: http://www.foodsafety.gc.ca/. Food and consumer product recalls are also available at http://www.healthycanadians.gc.ca/.